During the 1940s, Exchange had organized its club activities around seven areas of service that included: education; agriculture; aviation; citizenship; commerce and industry; federal youth rehabilitation; youth and geriatrics. Today, three Programs of Service and Exchange’s National Project, the prevention of child abuse, are lenses through which local clubs focus their energy and attention on their communities’ specific needs. The Programs of Service are Americanism, Youth Programs and Community Service. To help uphold Exchange’s Mission of inspiring communities to become better places to live, we have partnered with Veterans Matter, another national nonprofit. Veterans Matter is solely dedicated to providing deposits/first month’s rents for ready, waiting veterans who can use can use HUD-VASH vouchers to cross the threshold into safe, permanent housing. Veterans Matter has a 100% success rate in getting veterans housed in a government program that has a 91% success rate in keeping veterans housed. There are veterans waiting now; so, the urgency is immediate! Have you ever passed a homeless person on the street and wondered if they were a veteran? Have you ever seen a homeless person holding a sign declaring he/she was a veteran? Has your heart ached as you passed by – knowing what you could give would hardly impact his or her situation? Do you know that veterans account for approximately one (1) of every four (4) homeless people living on the streets – streets within the very communities they served to protect? Did you know that it’s not only veterans who are homeless, but their children and spouses as well? The reality that any veteran is homeless, let alone nearly 50,000 of them, is a stain on our nation’s honor. But, we don’t have to be powerless; working together, we can make a difference. The National Exchange Club believes there’s no better way to show gratitude for our freedoms than to thank a veteran; and, there’s no better way to thank a veteran than by taking care of those left vulnerable by homelessness. That’s why your local-level Exchange Clubs are committed to helping Veterans Matter raise the funds needed to get at least 2,000 veterans housed, as fast as possible. At a national average of $750 for a deposit, we can do this! America’s young people are its most precious resource. For many years, Exchange Clubs and National Headquarters have sponsored an impressive selection of activities designed to benefit and encourage our nation’s youth. Through college scholarships, mentoring and guidance, and service recognition, Exchange is making a difference for America’s youngest generations. 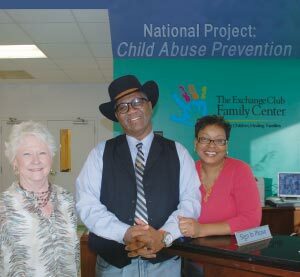 Child abuse prevention became Exchange’s National Project in 1979, at the 61st National Exchange Club Convention. To uphold its National Project, Exchange provides a variety of public awareness materials designed to help inform and increase awareness of child abuse and how it can be prevented. Such projects are implemented through Exchange Clubs and Exchange Club Child Abuse Prevention (CAP) Centers across the country. Through the scholarly-reviewed Exchange Parent Aide home visitation model, child abuse prevention experts work directly with at-risk families. Exchange was the winner of a Presidential Award from the White House Office of Private Sector Initiatives, is a charter member of The National Child Abuse Coalition, and is a Partner in Prevention with the Children’s Bureau, Administration for Children and Families, U.S. Department of Health and Human Services. For more information about the organization’s child abuse prevention efforts, including downloadable materials and additional resources, please visit the child abuse prevention page.